Mute/Unmute: This allows you to mute or unmute your microphone. Audio Controls (click ^ next to Mute/Unmute): The audio controls allow you to change the microphone and speaker that Zoom is currently using on your computer, leave computer audio, and access the full audio options in the Zoom settings. Start/Stop Video: This allows you to start or stop your own video. Video controls (click ^ next to Start/Stop Video): If you have multiple cameras on your computer, you can select which Zoom is using, access the full video controls, and select a Virtual Background. Invite: Invite others to join your meeting. Manage Participants: Opens the Participants window. Polling: Allows you to create, edit, and launch your polls. The options to create or launch polls will open up the Zoom web portal in your default browser. Share Screen: Start sharing your screen. You will be able to select the desktop or application you want to share. 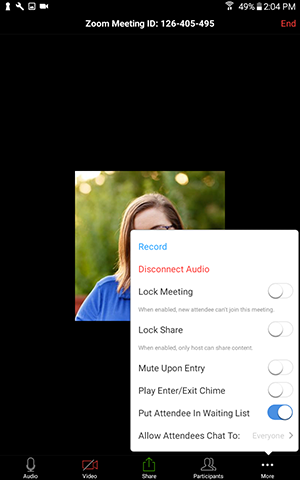 Screen Share controls (click ^ next to Share Screen): Select who can share in your meeting and if you want only the host or any participant to be able to start a new share when someone is sharing. Chat: Access the chat window to chat with the participants. Record: Start or stop a cloud or local recording. Closed Caption: If you have enabled closed captioning for your account, click here to access the closed caption options. 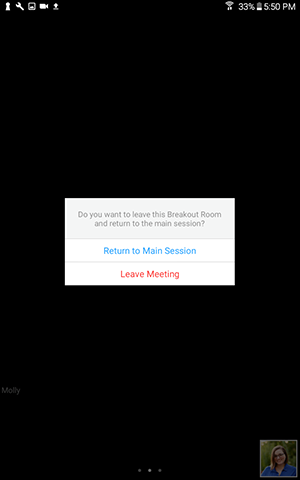 Breakout Rooms: Start breakout rooms. Live on Workplace by Facebook: Broadcast your meeting live on Workplace by Facebook. Live on Custom Live Streaming Service: Broadcast your meeting live on a custom streaming platform. When you are screen sharing, the controls will appear at the top of your screen, but you can drag it to another location. Learn more about screen share controls. 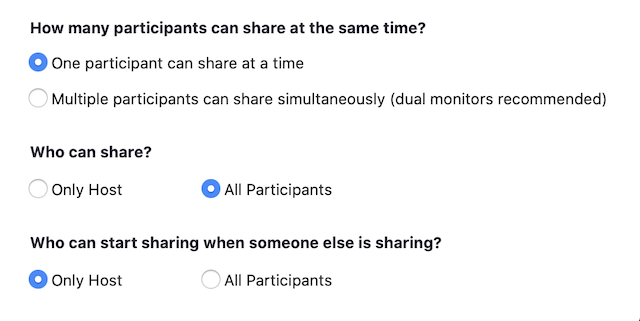 Screen Share controls (click ^ next to Share Screen): Click Advanced Sharing Options to select who can share in your meeting and if you want only the host or any participant to be able to start a new share when someone is sharing. Manage: View the participants list and manage participants. 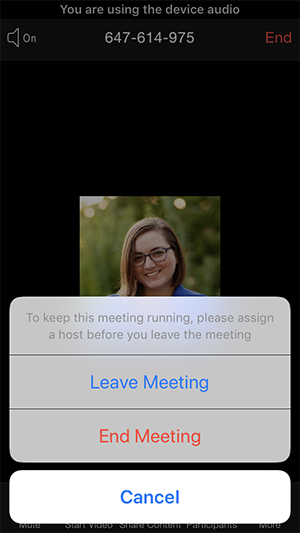 Leave Meeting: Leave the meeting. If you leave the meeting without designating another host, the meeting will end. 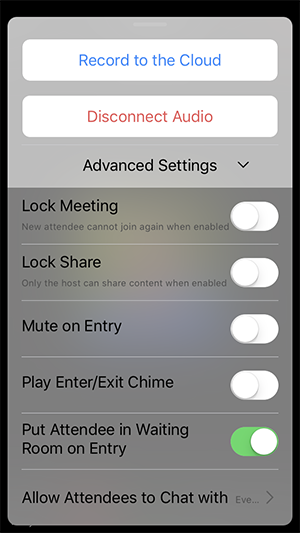 Learn more about meeting controls in the Zoom web client. Mute/Unmute: Mute or unmute your microphone. Start/Stop Video: Start or stop your own video. Share Content: Start sharing your screen or a file. Participants: View the participants list and manage participants. Record to the Cloud: Start a cloud recording. Advanced Settings: View the following advanced settings. Put Attendee in Waiting Room on Entry: Have participants enter a waiting room where you can then admit them. End: End or leave the meeting.